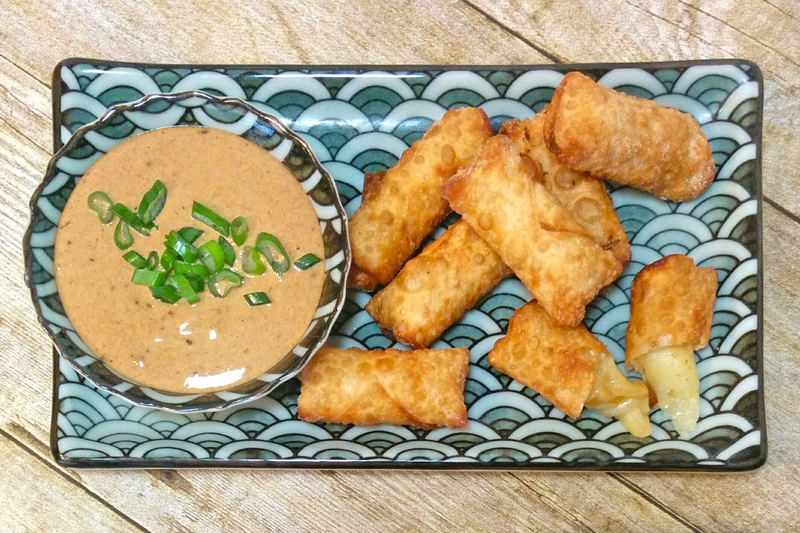 Recipe: Wonton Mini Cheese Sticks with Black Garlic Sriracha Mayo + Contest! Preheat vegetable oil to approximately 375°F. If you don’t have a thermometer, test the oil by dropping a plain wonton sheet into it. The wonton sheet should immediately begin to sizzle and take about 30-45 seconds to be golden and crispy. Slice mozzarella sticks into thirds. Place each third in the center of a wonton wrapper. Moisten all four edges with water using your fingertips. Fold in the lengthwise corners, then fold up the bottom corner, then roll up the wonton until it is secure. Check the ends to make sure there are no leaks. Allow to dry for at least one minute to secure the wrap. Mince or smash black garlic, then combine all mayo ingredients with a whisk or in a food processor. Garnish with scallions. Fry wrapped mozzarella sticks in small batches for 90 seconds at a time, or until wrappers are golden brown. Allow to cool briefly before serving. The mini cheese wontons can be made ahead of time and frozen in an air-tight container for months. This will increase frying time by 3-4 minutes. This recipe is even more delicious with a fresh egg mayo, so feel free to substitute if you have the time! 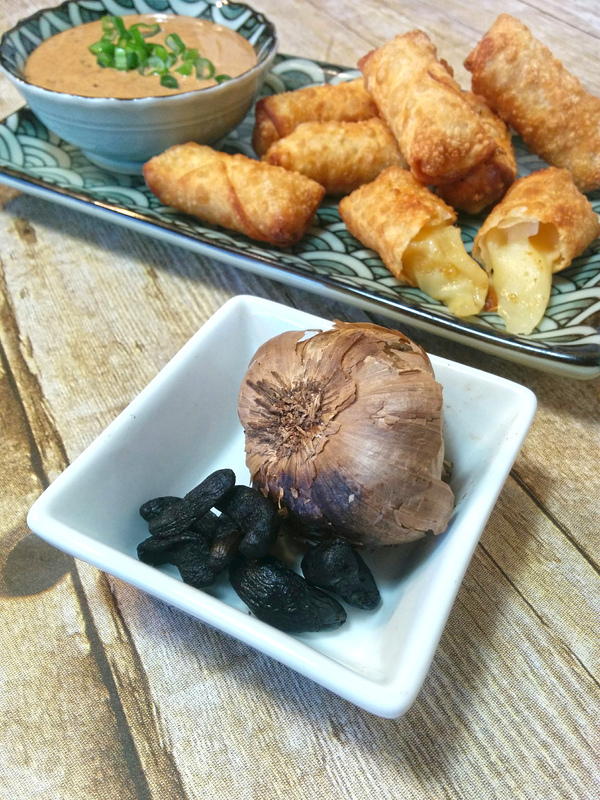 Loving the black garlic recipes? Grab your own Culinarie Garlic Kit here and get cooking! BLACK GARLIC GIVEAWAY AND CONTEST! 10 lucky cooks will win a whole head of black garlic! Black garlic is garlic that’s been fermented until it has a sweet, nutty flavor. This bizarre gourmet ingredient is delicious but finicky. What would you make with it? Let us know your idea for a black garlic dish below. If we pick yours, we’ll send you the garlic to make it! After you win your black garlic, send us your recipe and a photo! 1 lucky chef will win our Garlic Lover’s Kit to create all kinds of delicious, garlic-themed dishes at home. Bonus: contributing chefs may have their recipes featured on our blog! Entries accepted through 3/31/18.